Suzanne Kingery, MD, associate professor of pediatrics, and Eli Pendleton, MD, assistant professor of family medicine, are recipients of the University of Louisville 2018-19 LGBT Center Ally Award for the Health Sciences Center. The UofL LGBT Center presents the awards based on nominations received from UofL faculty, staff and students. Both faculty members of the UofL School of Medicine are recognized for their work in LGBTQ medical education, patient care and advocacy. Kingery is a pediatric endocrinologist with UofL Physicians and the fellowship director in the UofL Division of Pediatric Endocrinology. She was nominated for her knowledgeable and enthusiastic instruction, mentorship of faculty and students, and advocacy for LGBTQ students and patients. “Dr. Kingery is a phenomenal ally. Beyond her exemplary patient care with LGBTQ individuals, she goes above and beyond to teach medical students to best serve the LGBTQ community,” said Jerome Soldo, a second-year medical student. Kingery delivers lectures to second year medical students covering transgender care and gender-affirming hormones, instructing them in prescribing these therapies. She also informs the students about negative health outcomes that affect transgender individuals and correct pronoun usage to ensure patient trust and comfort. Pendleton is associate program director in the Department of Family and Geriatric Medicine and also educates future physicians in the care of LGBTQ patients. He has been a persistent advocate for furthering medical student education in LGBTQ care and regularly mentors students who are interested in LGBTQ health care. In his practice at UofL Physicians, Pendleton provides LGBTQ patients with a safe and knowledgeable medical home. “His patients rave about him and he has put himself out there very publicly in our community that he is here for trans and genderqueer patients,” said Susan Sawning, MSSW, director of undergraduate medical education research in the School of Medicine. Pendleton also has taken on a clinical leadership role for a proposed LGBTQ clinic within UofL Physicians. 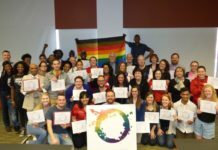 The clinic is intended not only to benefit people in the LGBTQ community, but to provide an opportunity for clinical training and role modeling for UofL medical students who have been instructed in LGBTQ care as part of the UofL eQuality Project. Earlier this year, Geri Morgan in the Office of Student Affairs received the LGBT Center Ally Award for Belknap Campus.